Israel's Timue Margolin won his second bracelet and €134K in WSOP Europe Event #5 (€1,100 NLHE Monster Stack). It’s another bracelet for Israel at the 2018 World Series of Poker Europe as Timur Margolin bested the 666 runners in Event #5 (€1,100 NLHE Monster Stack) for €134,407 and his second career WSOP gold bracelet. The victory for Margolin may have seemed improbable at the beginning of the final table. With only ten players left, Margolin was ninth in chips. However, after winning his first WSOP bracelet in Las Vegas earlier in 2018 (Event #43: $2,500 NLHE), Margolin used his experience to ladder through the competition and eventually accumulate a chip lead to large for to overcome. The first of the final nine to fall was Italy’s Mario Llapi. After an early position raise by Germany’s Henrik Brockmann, Llapi shoved a little over 20 big blinds holding . Brockmann snap called with his and Llapi was at risk. The flop came [5h[ giving Llapi four outs to the straight. The turn peeled off and completed the board providing no help for the Italian. Llapi collected €8,920 for ninth place. Roughly an hour and a half later another all-in confrontation claimed the tournament of Amar Begovic. Severely short, Begovic shipped his last three big blinds under the gun with . Brockmann flat called with . Both of the blinds decided to get involved as well. 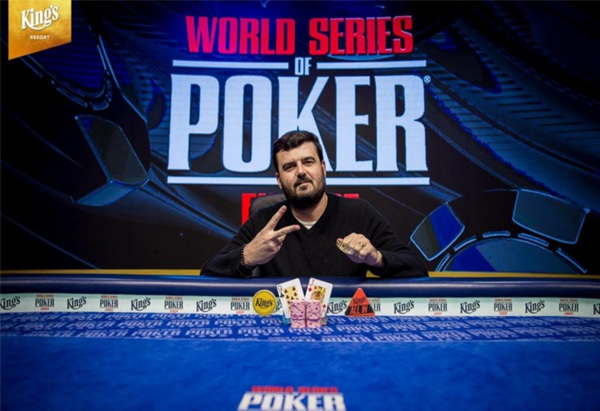 Michal Mrakes called from the small blind with and 2018 WSOPE bracelet-winner Mykhailo Gutyi also committed chips with from the big blind. The action checked through to the turn as board ran out . On the river, Mrakes made a small bet called by Brockmann, both with full houses. However, the man who started all the action, Begovic, finished the hand in last place and headed for the cashier to collect his €11,656 eighth place payday. Tamas Szunyoghy moved all in on the button with and was quickly called by Raul Villarroel in the small blind who held . The flop came keeping Villarroel’s ace-high in the lead. The turn offered no extra outs to Szunyoghy, who saw his tournament come to an end as the completed the board.Szunyoghy fell in seventh place for €15,502. Twenty minutes later, Gutyi’s quest for a second World Series of Poker Europe bracelet came to an end. Sebastian Ulrich raised in the hijack with and Gutyi made the call with in the big blind. The flop provided the action when it came . Gutyi made the first move, open shoving his remaining ten big blinds. After a count, Ulrich called with his two-way straight draw. The turn brought the completing the straight for Ulrich and putting Gutyi in bad shape and looking for three outs for a chop. The river was the and Ukraine’s Gutyi added another €20,974 to his earnings for sixth place. Mrakes made his final stand fifteen minutes later and Margolin began a run of eliminations that would take him to the end. After Margolin min-raised under the gun with , Mrakes three-bet shoved with for roughly 15 big blinds. Folded back to Margolin, after some thought made the call. The flop offered some counterfeit outs for Mrakes as it came . The turn was of no use to Mrakes and the river sealed his fate. Mrakes finished in fifth for €28,863 for his fourth cash of the 2018 WSOPE. The next two eliminations happened quite quickly. After busting Mrakes, Margolin began to amass a healthy chip lead. He opened under the gun with and Brockmann made an all-in move with his final ten big blinds with . Folded back to Margolin, he made the quick call. The board rank out sending the German home in fourth place for €40,388. Ten minutes later the chip leader was at it again. In a limped pot, blind versus blind, Margolin held on a 9h] flop. Ulrich with in the big blind floated. The turn was the giving Margolin the full house and the action checked through. The came on the river and Margolin put out a small bet which prompted a bluff shove from Ulrich. Margolin with plenty of chips and a full house made the call eliminating Ulrich, who collected a healthy €57,447 for third place. Heads up play between Margolin and Villarroel began with Villarroel at a 10-1 deficit. And even though he received an early double-up, Villarroel could not overcome the odds this time. Margolin shoved the button with and Villarroel snapped his remaining 10 big blinds with . The was safe for Villarroel. But when the dropped on the turn, only two outs in the deck would save him. The river was the last card of the tournament as Villarroel received €83,042 for far-and-away his largest recorded cash. Timur Margolin takes home €134,407 for the victory and is the third 2018 WSOPE bracelet winner from Israel. He is also the third winner of the series to earn his second career bracelet in Rozvadov.